Nucleus is the largest organelle in eukaryotic cells and was discovered by Robert Brown. 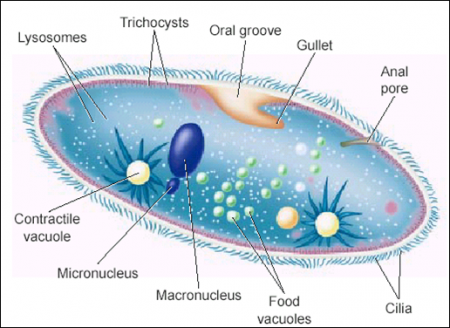 It is present in all eukaryotic cells and absent in prokaryotic cells. Uninucleate- cells with single nucleus. Binucleate- cells with two nucleus. Multinucleate- cells with many nucleus. 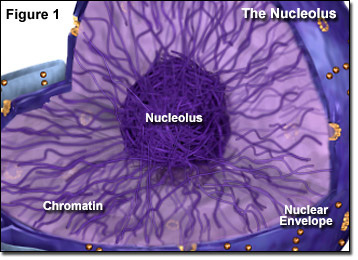 Nucleus is surrounded by two membranes called the nuclear envelope or the karyotheca. 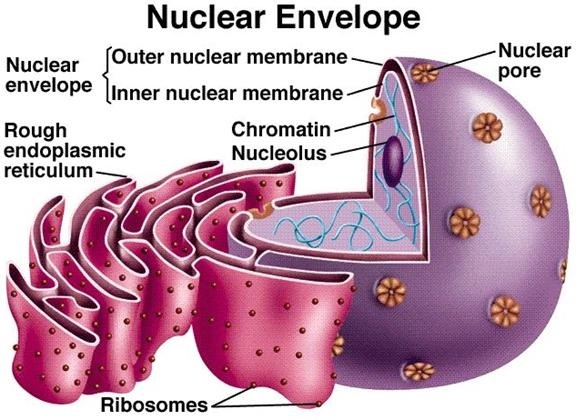 The inner nuclear membrane defines the nucleus itself. In many cells the outer nuclear membrane is continuous with the rough ER and the space between the inner and outer nuclear membrane is continuous with the lumen of the rough ER. The two nuclear membranes appear to fuse at the nuclear pores. These ring like pores are constructed of a specific set of membrane proteins and these act like channels that regulate the movement of substances between the nucleus and the cytosol. Pores allow exit of macromolecules. Network of fine criss cross fibrils. It remains intact after chromatin and DNA has been isolated. Replication and transcription are associated with it. Transparent semifluid formed of mixture of proteins, enzymes, nucleotides nucleic acids and metal ions. Spherical body in all eukaryotic cells that disappear during cell division. Associated with specific region in the chromosomes – called nucleolar organising region. The size of the nucleolus is associated with synthetic activity of the cell. Cells with little or no synthetic activity has small or no nucleolus. Depending on the activity a cell can have more than one nucleolus or many nucleolus. b)It helps in formation of ribosome subunits. c)Play an important role in cell division. Euchromatin: is the lightly stained region of chromosome, and is lightly coiled. 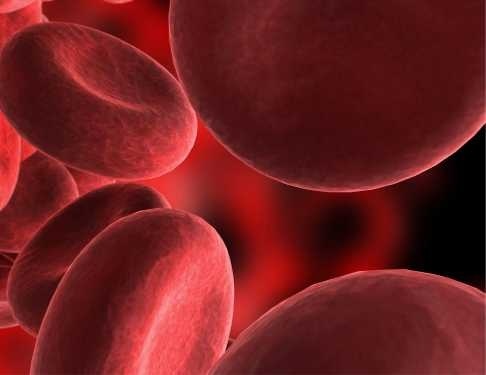 It forms the major portion of the chromosome and is considered as genetically active. Hetrochromatin: is the darkly stained region of the chromosome and is highly condensed. It forms the genetically inert substance, but controls the metabolism of chromosome. There is a narrow clear zone in a darkly stained chromosome. Centromere lies in this region, Centromere associated with proteinaceous granule like structure– kinetochore. Centromere divides the chromosome into two parts- chromosomal arms. If the arms are of equal size they are called isobranchial and if the arms are of unequal length it is heterobranchial. Linear duplex DNA strand, associated basic proteins- histones, acidic or neutral proteins- non histones, small amount of RNA, enzymes, phosphorous containing organic components and inorganic components like salts. 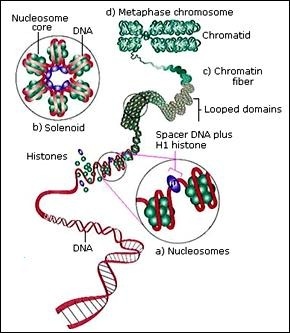 The chromatin is in the form of long chromatin fiber and shows beaded appearance, each bead is called a nucleosome. Core particle- an octamer of 8 histones. Double stranded DNA wrapped around core particle. Linker DNA- connects two adjacent nucleosomes. H1 protein in relation with each nucleosome. Nonliving material in the protoplasm of a cell, such as pigment granules, fat droplets, or nutritive substances. They include both organic storage materials and inorganic crystals. Starch grains- occur in plant cells in storage organs like roots, tubers etc. 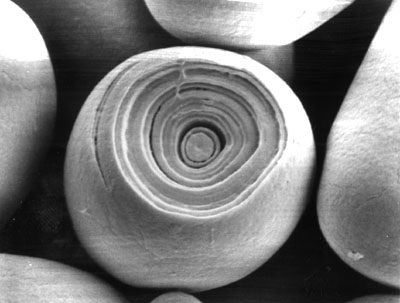 Under microscope the starch appears to be built of numerous concentric or eccentric rings. These rings are formed around a small dark round spot made up of protein called Hilum. The arrangement is Concentric in Pea, Eccentric in Potato. Starch grains with a single hilum is called Simple Grains e.g. Maize and wheat. Starch grains with more than one hilum is called Compound grains e.g Potato, rice, oat. These are carbohydrates stored as a reserve food in fungi and animal cells like liver cells and muscle cells. The glycogen granules are normally found near the smooth endoplasmic reticulum. They are in the form of small, spherical or large rossette shaped particles. 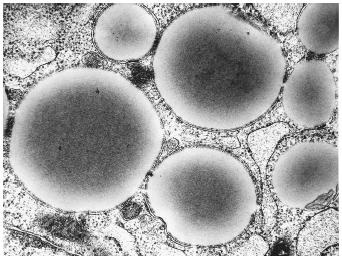 Fat droplets are found in fat storing cells of animals called adipocytes. The fat droplets accumulate in the cell occupying major space, thus pushing the cytoplasm to the side. In plants it is found in the endosperm of castor and coconut seeds and in cotyledons of groundnut, mustard and other seeds producing oil. Various chemical compounds, organic and inorganic are found in the form of crystals in plant cells. The most common ones are calcium oxalate, calcium carbonate, calcium sulphate and silica. Needle like calcium oxalate crystals are found in Lema (duckweed), these are called raphides. Leaves of Ficus contain mass of calcium carbonate called cystolith.